Hello everyone! Today, I’ve got a real treat for you. 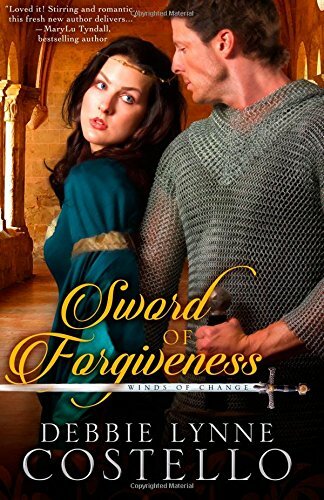 I recently read The Sword of Forgiveness, and let me tell you it is a wonderful book! But not only am I reviewing it today, but I have a special guest on my blog, the author herself: Debbie Lynne Costello! And not only that, by she is graciously giving away a copy of her tale, either kindle of paperback in the Continental U.S. or a kindle edition outside the continental U.S. Details on how to enter are below, but first I wanted to introduce the author herself! Debbie Lynne Costello has enjoyed writing stories since she was about eight years old. Arabian and Tennessee Walking horses. Thank you so much for taking the time to join us today! For starters, tell us a little bit about Sword of Forgiveness; what makes it special to you? Sword of Forgiveness is about Forgiveness. 3 aspects of it actually. First is the forgiving others who have hurt you or harmed the ones you love. Second is being able to forgive yourself for your past. And third is believing that God has forgiven you. Sword of Forgiveness is a story of my heart. This was a story I knew God wanted me to write. I’m always fascinated by authors’ journeys to getting their stories published. So, what’s the story behind yours? Sword of Forgiveness was the first story I wrote. It’s been through 2 editors, my critique partner has toiled over this so many times she can probably quote half of it, and I’ve gone over more times than I can count. Almost 20,000 words were cut from the original document by the end of it all. But 8 years ago you couldn’t find anyone who’d pick up medievals. Matter of Fact, I had many rejections from agents telling me to write something else and they’d like to see it. medievals were taboo in the Christian market place. Melanie Dickerson sold her fairy tale retelling to Zondervon for YA and then many years later, the publishing industry seemed to realize that it wasn’t just YA buying Melanie’s books. But I truly believe that it was Melanie’s books that broke down that barrier and so this year we are seeing medieval time period in the CBA. I love your characters, Royce and Brithwin. Each is an interesting mix of the medieval, feudal thinking and a bit more modern ideas. Was it difficult to find that blend of the medieval thought and a relationship that echoes with modern readers? Not really. Because I love the time period, I just wrote what I love. The truth is there are somethings that in our world today we’d be appalled at if it was put in a book. We wouldn’t be able to connect with the characters at all if we followed history. Girls married at VERY young ages, as young as 12. That isn’t to say that every 12 year old girl was married but it wasn’t uncommon. The medieval times, especially in the late 14th century wasn’t as barbaric as one might think. It is the beginning of the Renaissance period which I’ve heard it described as a bridge between the middle ages and more modern times. Speaking as one myself, do you have any words of wisdom for the aspiring authors out there? Probably nothing you haven’t heard before. :o) This is a tough industry to break into, so don’t give up. 1st find yourself a good critique partner that you really connect with. Just having a critique partner that is good at critiquing is nice but having one that understands you and your writing and can help you through the times when you want to quit is worth their weight in Gold! 2nd grow a tough skin. I’m not sure my skin is tough enough but I’m trying! This is an industry that is so subjective. What one person likes another may hate. You will never be able to please everyone. Keep that in mind. 3rd the industry is changing almost daily. It’s harder than ever to get an agent and a publisher. But for the first time self-publishing is acceptable by most and many writers are becoming hybrids. So pray, pray, pray for God’s direction and timing and then be patient. Being a writer certainly takes lots of patience! And lastly, make sure your book is top notch before you do anything with it. Don’t be in a hurry (see I told you it takes a lot of patience). There is lots of competition out there, make sure they see your best! This story is amazing! A great combination of sweet and suspense-filled, it is certainly one to read if you’re interested in Medieval tales. The setting itself is incredible, rich with detail, and obviously based on extensive research. There’s a wonderful glossary at the front with definitions of many medieval terms used throughout the book, which personally I love that it’s at the front, rather than hidden at the back and hard to find. And then there’s the story itself. The book practically opens with murder, and just continues the intrigue from there! There’s several wonderful surprises along the way, many of them truly shocking. The villain is great, a wonderful antithesis to the hero. Then you have Brithwin and Royce, a couple who have sparks even before they meet! Brithwin is exceedingly strong, and completely independent. She is capable, able of running her own lands without help. And she hates being put under a man. Royce certainly has an interesting reaction when he meets his wife, a woman who isn’t meek and submissive. He is a good man, strong man, though he has a past that haunts him. It’s interesting watching these two react, as neither is willing to bend. I’m not gonna lie, there were times when I wanted to jump into the story and shake some sense into them, but that’s usually when the author did so for me. And then there’s the message of forgiveness, practically permeated into the pages. There’s a great mix of romance, suspenseful intrigue, adventurous detours, and a remarkable cast of characters, both good and bad. This story made me sigh with happiness, weep with sadness, and kept me on edge with suspense until the very last page. It is a mature tale, and very deep, but well worth the read. Definitely a book that I recommend. Intrigued? You can find this book on Amazon for Kindle and paperback, or you can enter to win a copy from the awesome author! I asked my own questions from this wonderful author, but now it’s your turn. To enter for the free book, comment below with a question of your own for Debbie Lynne. Enter before next Thursday at midnight for a chance at this awesome book! Hi! I’m on time this time! lol. So this week’s is an interesting post. I have to start by saying I don’t like westerns. Yes, I grew up in cowboy central, but I’m not a western fan. Movies, books, name it I probably haven’t seen or read it, and most likely have no idea what you’re even talking about. I don’t know why, but it’s not my cup of tea, I’m more of a European kind of girl. So this author came as a huge surprise to me: Karen Witemeyer. 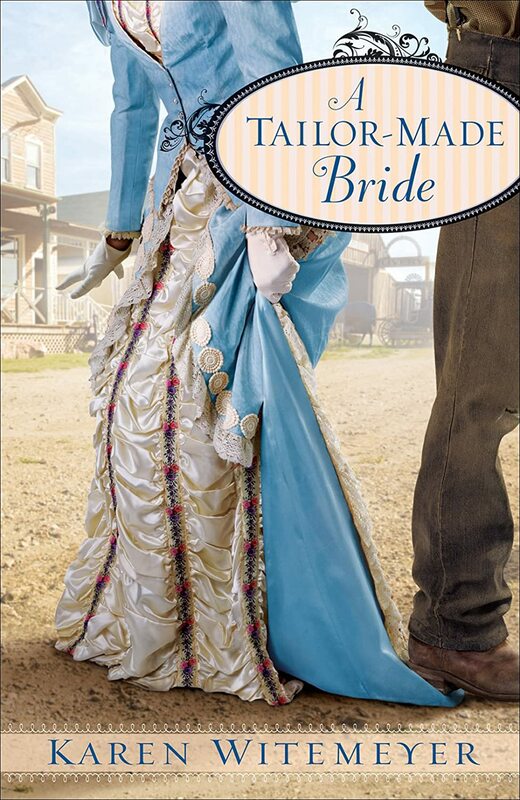 Like I said, not a western fan, but when I saw the cover and read the premise of A Tailor-Made Bride, I just had to give it a chance. Seriously, a fancy dressmaker in an old west tale? It just sounded intriguing. So, I finally gave it a shot. Let me tell you: I was hooked! Seriously, this book is awesome! It has this wonderful blend of classic sophistication, along with strong capable women, and the fun of the west, of towns just forming and coming to be. I love the setting of Coventry, Texas, a fairly young western town, but one that’s grown into a city that feels like it could have been placed on the Eastern coast and still have been believable. And then you have the main characters, JT and Hannah. The tag line of the book is “When a dressmaker who values beauty tangles with a liveryman who condemns vanity, the sparks begin to fly!” And it’s perfect for the book! Hannah is a skilled seamstress, and now a business woman opening her own shop. She loves beauty, the God-given beauty that every woman has, giving them the gifts of gowns made from God-made colors. I love that she’s so strong, opening up her own business, but soft, loving the artistry of putting colors together and creating beauty. Then there’s J.T. who’s got a heart of gold himself, but with a past that includes a particularly vain woman, his view is skewed to believe that anyone who values outward appearance doesn’t value the inward. He loves his sister, and helps out his neighbors all that he can, especially a widow with children. I love so many in the book are business men and women: Hannah runs her own dress shop, JT’s sister bakes and sells her goods at the general store, and the friendly widow does laundry and works hard to take care of her three children. There’s such a great message about working hard, and of course it’s so awesome to see such a positive message about women working! Even marriage doesn’t mean the woman gives up on her business dreams. And of course, I can’t help but love the interactions between JT and Hannah. It’s funny how both value what’s underneath, but at first neither can see past the exterior: Hannah’s beauty and JT’s gruffness. They have some very sweet moments that just warm your heart, but the next page has them bickering like Benedict and Beatrice! And there’s a good amount of adventure and suspense that had me on the edge of my seat to the very last page wondering if it’ll all turn out okay. Strong women, heroic men, and a great mix of cowboys and culture make this a great read. Seriously, if you’re into westerns, or Victorian, give this book a shot. You can get it for Kindle and NOOK (and my personal favorite paperback). And feel free to check out the author’s website and Facebook page for her other works and upcoming ones too! Hello all! So, this past weekend my husband took me to the new Cinderella. It. Was. AWESOME! Seriously, this movie is everything a Cinderella story should be. It has great nods to Disney’s classic, along with some interesting nods to Ever After (which, if you haven’t seen, is a very interesting take on Cinderella: if she was real.) This has easily become one of my favorite fairytales with it’s amazing setting, costumes, magic, and of course the message: Have Courage and Be Kind. So, since I’m in a Cinderella mood, I figured I’d continue that line of thought and review a few of my favorite Cinderella book retellings! I’ve got two fantastic books for you today, and lots of Cinderella stories that are delightful, magical of all sorts, and sweet with their romances. Of course, one of my favorite Cinderella tales is The Captive Maiden by Melanie Dickerson (which I reviewed earlier), but today I’ve got two more books: Cinderella by Jenni James in her Faerie Tale Collection, and Five Glass Slippers, a collection of five stories all centered around, you guessed it, glass slippers. Like all of Jenni James’s stories, Cinderella is a charming retelling of the classic, with a little bit of sass added. Ella is definitely the traditional ‘Cinderella’ character, working without complaint and putting up with her step-family’s meanness, but she’s got some twists that I love. She’s a no-nonsense, strong woman who has no problem standing up to the new boy who comes around distracting her from her work. Now Anthony is definitely not your typical Prince Charming. He has no trouble disguising himself as a servant to do some sleuthing. I love the interaction between the two. Unlike most Cinderella stories, these two have a history, playing as kids together even before they meet back up. Of course, it’s so nice watching them develop an actual friendship and relationship before the ball. Now I think my favorite change was with the step-sister, Lacey. She’s a little full-of-herself, but doesn’t have the traditional animosity towards Ella, and you almost feel as sorry for her as you do Ella. I love the little changes to the classic story, including who the ‘fairy godmother’ turns out to be. This is definitely a Cinderella retelling that’s not to be missed. 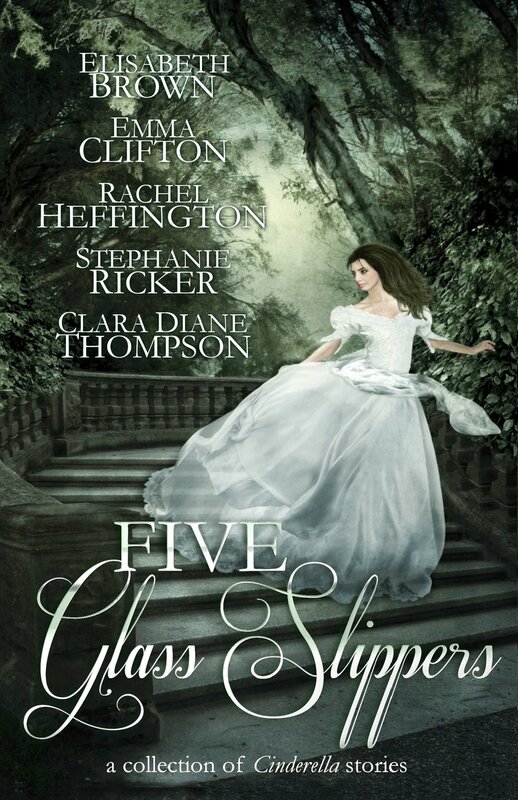 As for the Five Glass Slippers, this charming collection from five talented young authors is sure to delight any fan of the classic fairytale. Each tale has the classic elements: ‘Cinderella’ is a hard worker, whether a servant in her step-family’s house or working a very unfavorable job, and of course there’s the ‘prince’, the ball, and, as the title implies, glass slippers. But each author has wonderfully woven the traditional elements with her own unique ideas. Every story is uniquely separate from the others in this collection, from an adorable traditional romance to a supernatural mystery and action packed science fiction. The book starts off with Elisabeth’s Brown’s What Eyes Can See. This is classic Cinderella at its finest. Cinderella goes to the ball, captures the eyes of the prince, and is chosen by him when the lost glass slipper fits her foot. The beauty of this story is that Arella doesn’t want him, especially not after one night of nothing but dancing. But the best part is that this isn’t just Arella’s story; instead this is Drusilla’s, her step-sister who has a heart of gold even if her face is a little plainer. And I love how this story’s kind of a slap-in-the-face to the old-school prince charming who only sees the outside beauty, as Prince Frederick is given quite a good lesson about what he should be looking for in a bride. It’s a sweet tale with a heart-warming ending. Emma Clifton follows with a steam-punk tale of her own, Broken Glass. The tale starts with a question that I’m sure so many have: what if the slipper fit the wrong girl? Well, Rosalind isn’t the girl who danced with the prince, at least not the one who she apparently now has to marry as her slipper was on the foot of the girl who did dance with him. On top with it she’s in love with the youngest prince, Henry. Stuck by a king’s order to marry the girl who fits the slipper, Marius is not happy when he’s presented with a spit-fire lady who detests him rather than the sweet one he danced with. The sparks fly wonderfully when these two are together. Henry, trying to be important and help, goes on a search to find the real girl, and finds Evelyn, a factory-working cinder-girl. While the sparks fly between Marius and Rosalind, there’s a much softer relationship budding between Marius and Evelyn. Throw in a power hungry middle-child, a novice fairy godmother, and a pinch of magic, and this tale is sure to delight. Rachel Heffington is the third author, writing The Windy Side of Care. Now this is a very interesting twist. What if Cinderella didn’t become the princess by marrying the prince, but because she was born the princess? Alisandra fully believes that she is the daughter of the king, while Auguste, the prince, was switched with her. From the beginning she’s strong willed and fully intent on fighting for her rightful place. What she didn’t anticipate was meeting Auguste and, heaven-forbid, liking him! Auguste, for his part, hates being a prince. Too many rules and duties, and when he meets the girl who’s the spitting image of his father, he begins to wonder if the reason he hates it is because it isn’t him. There’s a cute romance between them, but when they decide to hatch a hair-brained scheme to solve both their problems, things quickly get out of hand. There’s a good mix of the strong heroine, a cute romance, and a crazy adventure to make this story interesting and memorable. Next comes A Cinder’s Tale by Stephanie Ricker, where Cinderella meets Star Trek in this Sci-Fi spin off. Elsa’s a Cinder, a miner of cendrillon on a Jupiter-like planet, and is quite content surrounded by her friends, and fellow Cinders: Bruno, Jaq, and Gus. (And yes, props for the adorable friends referencing the classic Disney.) There’s also the interesting fey, a unique alien, named Marraine. Add to that the boss, Nebraska, who’s always tempermental, and her clone assistants, Camilla and Priscilla, and you have a cast worthy of any sci-fi. I love how the ‘king’ is a great fleet general, and his son the up-and-coming officer. I love Karl; he’s every bit the traditional sci-fi officer, but he’s also humble, hating his knick-name of the ‘prince’. The relationship between Karl and Elsa is sweet, the traditional Cinderella style, but that’s about as traditional as this story gets. Throw in some movie-worthy action, and heart-stopping suspense, to complete this distinctive retelling. The last tale is The Moon Master’s Ball by Clara Diane Thompson. This took the fantasy of Cinderella and expounded it. Tilly is a quiet soft-spoken servant, perfectly content in her life, as long as she doesn’t have to deal with the local’s favorite supernatural fair: Bromley Meadow. While others only see the wonder, she saw the darkness and hates there. But for the man she considers a father, she risks going to meet The Moon Master. The characters she meets along the way are straight from any good fantasy, especially the man considered The Moon Master. The darker tale has Tilly not just going to a ball, but single handedly expected to face the darkness and free the one imprisoned by it. It’s a great tale, centered in an exciting fantastical world that’s sure to delight even while its suspense has the reader at the edge of their seat. These are definitely stories well worth a read, especially if you’re on a Cinderella kick like I am. (Thanks Disney! lol). 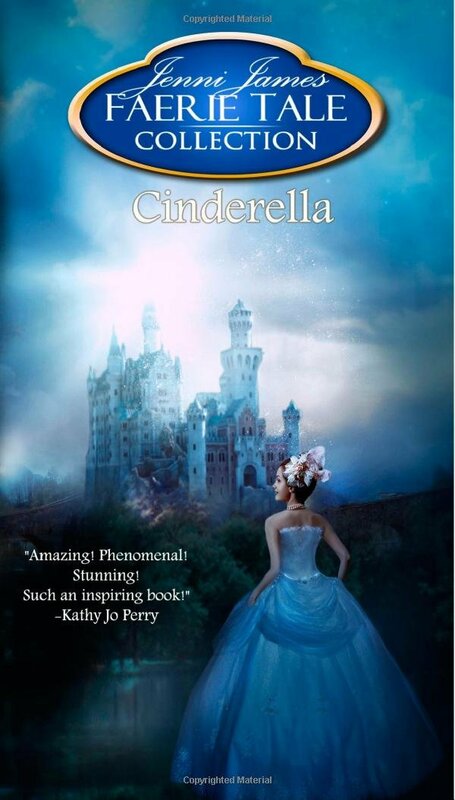 You can get Cinderella for Kindle and NOOK (and paperback) and Five Glass Slippers for Kindle and NOOK (and paperback) as well. And be sure to check out these awesome authors’ websites: Jenni James (and her Facebook), Elisabeth Brown, Emma Clifton, Rachel Heffington, Stephanie Ricker, Clara Diane Thompson. Enjoy Cinderella, and her glass slippers, in all her glories! Hello! Okay, so I’m a day late. Hey, ONLY 1 day late this time! LOL. So see? I’m doing better. Anyways, this week I’m going back to one of my favorite authors: Julie Klassen. I started reading her almost since she was first published, and I haven’t looked back. She has an amazing gift of mixing Regency Romance with Suspenseful mystery and making it work extraordinarily! 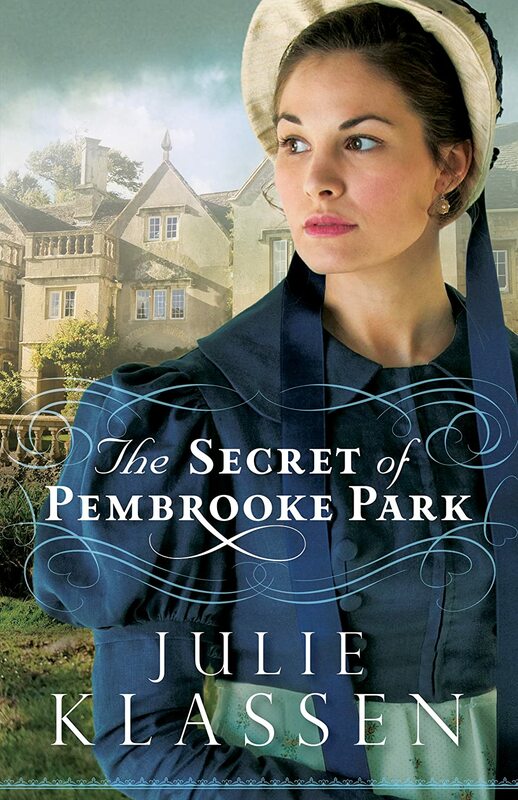 Some of hers are more on the sweet romance side, but her newest one, The Secret of Pembrooke Park, has Gothic suspense written all over it. Imagine Sense and Sensibility meets Jane Eyre and you have a slight idea of the fun this book was to read. It is so rich and vibrant with the regency era life and culture, but she throws in her own mix of mystery and intrigue so often missing in modern-written regency novels. The setting itself is extremely vibrant, especially when Abigail first enters Pembrooke Park. It is chilling as you wander through the rooms with her, seemingly abandoned in the middle of life: a tea set placed out with dried tea still in the cups, and of course the doll house left, waiting for its owner to return. As she tries to set the house to right, Abigail finds more mysteries than answers, and the more people she meets, the more suspicious she becomes. I can’t help but adore the character of Abigail. She’s so quietly strong, a very interesting mix in her personality. When the man she adores turns from her to her sister, she still holds her head high and continues her life, and when her family encounters trouble, she takes the lead in moving to Pembrooke Park. And she is so kind, sacrificing her own future to see that her sister can have one of her own. Her love for her family is what leads her to follow the rumors of treasure buried in a secret room, though her curiosity leads to a few difficult circumstances. Then you have the character of William, the local curate, who is a complete gentleman at heart. Even when they meet in circumstances that would have been considered scandalous, there is not a hint of impropriety in his mannerisms or interaction with her. And even the minor characters are extremely well rounded, each almost an enigma themselves. Some books have supporting characters that are one-dimensional, but so very few in this book are, and that itself is refreshing. And the plot, the mystery, was one of the most intriguing I’ve read; it kept me in my seat unable to put it down, and took me on so many twists, and even came to a very shocking conclusion. This is definitely a great book for anyone who likes regency, romance, and a good mystery.